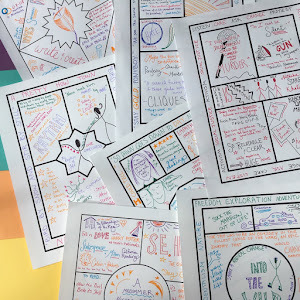 One-pagers are becoming increasingly popular as a way to help students process what they have read in one powerful activity. Like sketchnotes, they combine visuals with text to make ideas come alive in students’ minds and memories. But it’s easy for students to struggle with one-pagers if they are not naturally inclined toward art and have not previously been encouraged to represent their ideas this way. They may feel they are being graded unfairly on their artistic abilities. Some students will hear directions to create a graphic representation of a reading and dive right in. Others will moan and mutter things about "ridiculous art projects." 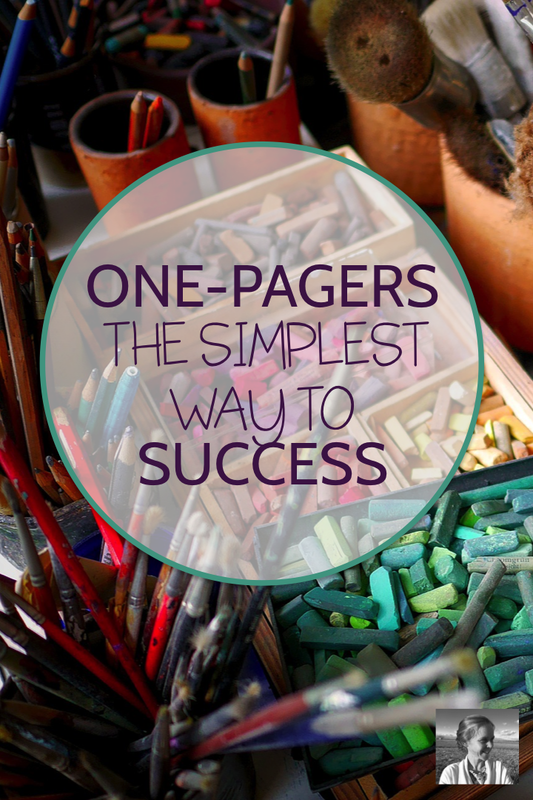 But the popularity of one pagers with teachers lately is undeniable. 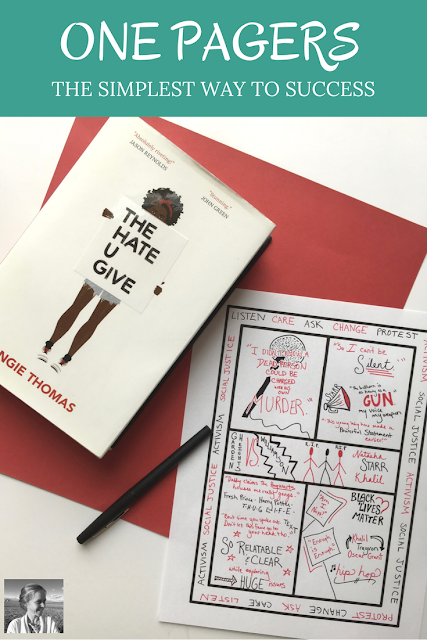 If students can get over their hang-ups, they really learn a lot from processing what they've read in visual form with a one-pager. So how to help the art-haters thrive alongside the artists? How to show everyone that their one-pagers are about critical thinking and interpretation, not just flair pens (though flair pens are a pretty fabulous addition)? When you provide students with a clear and straightforward template with instructions for what to put inside each section, you give them some creative constraint that can actually help inspire them to do their best. An image in the upper left hand corner with a quotation woven into or around it. This image should somehow represent what you consider to be the most important symbol in the text so far. Images and/or words in the bottom right hand corner that show connections between the themes and ideas in the writing and what is going on in the world today. This way, students have a clear to-do list, and avoid the writer's/artist's block that can get in the way. You can experiment with varied templates, and even start letting students who want to go off template once they get comfortable with the structure. Want to get started right away? I've designed a free packet of four templates with four different sets of requirements. You can see them in the photos above, or check them out in the quick video below. 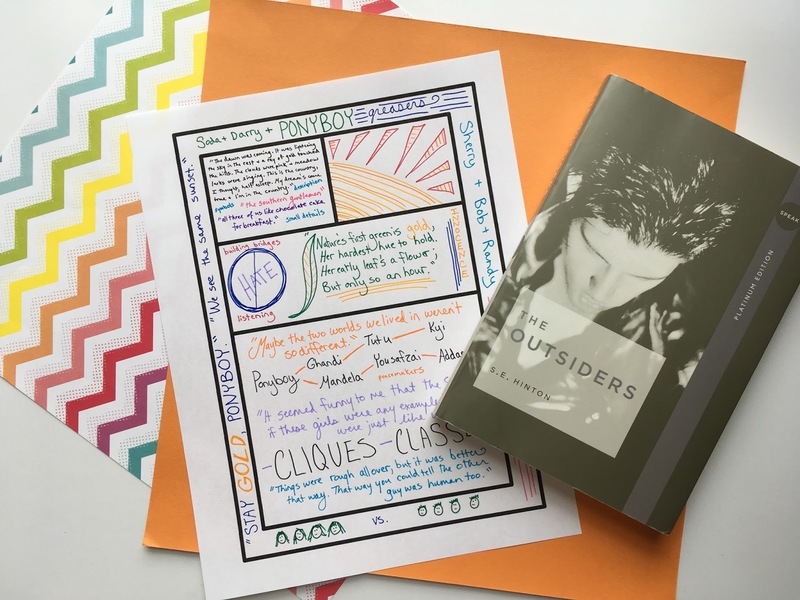 You're going to love watching your students create these beautiful literary visuals! I can't wait to send it to you. Just sign up below. You'll also receive occasional e-mails from me chock full of creative teaching strategies and inspiration. Hi, looking for the one-pager template - it wasn't sent when I subscribed. Would you be able to provide a link? Thank you so much! So sorry I missed this somehow! It may be lost in your downloads folder - it pops into that folder when you confirm your subscription. Just e-mail me at betsy@nowsparkcreativity.com and I will send you a copy. I have been using one-pagers for awhile with my 4th, 5th, and 6th grade students. I use them with language arts and science. They create great projects with so much creativity. I look forward to seeing your templates to add to what I am already using. I am excited about trying one pagers with my classes.